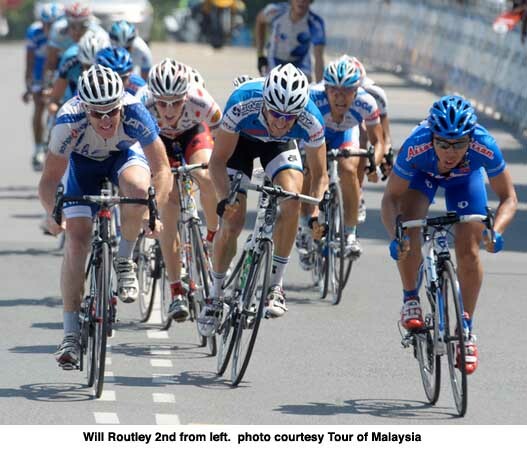 Will Routley finished 4th in the bunch sprint for today's 6th stage. His efforts have now put him in 4th overall, with 2 more days of racing to go! 14 Timothy Roe (Aus) Savings & Loan Cycling Team all s.t. 97 Bernard Van Ulden (USA) Jelly Belly Cycling Team all s.t. 5 Hossein Askari (Iri) Tabriz Petrochemical Team s.t. 8 Timothy Roe (Aus) Savings & Loan Cycling Team both s.t. 12 Jai Crawford (Aus) Savings & Loan Cycling Team s.t. 17 Ghader Mizbani (Iri) Tabriz Petrochemical Team all s.t.